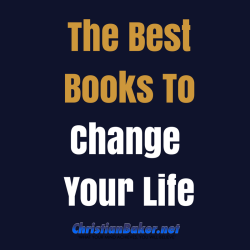 What Are The Best Personal Development Books To Help Change Your Life? What are the best personal development books to read? This is a question I often get asked, from clients, readers of my blog and on social media. Books can change your life, but which are the best self improvement books to read. Well I’ve read loads of books over the years and my answer is… there isn’t just one book, there are many great books out there, but I don’t think there is just one. I’ve read a book before, and I didn’t get too much from it, then read it again another time and got more from it. So it all depends where you are, what you are currently going through, as to which is the best book for you. And I always think, if I read a new book and only get one new idea, one pearl of wisdom, then it’s been worth the investment. So make a commitment to invest in yourself, keep learning, keep growing and keep developing yourself. I haven’t read as much in the last 12 months, and I’ve got a pile of unread books to absorb, so I’ve set myself the challenge to read one new book a week, so will you join me? I’ll share the book I’m going to read, so feel free to read along with me and see which books we can enjoy in the next 52 weeks. To keep up with my reading challenge, make sure you click subscribe to my YouTube Channel, and if you have any book recommendations, please leave a comment below the video, and I’ll let you know if I add it to my reading list.